The Chief RPMA245 RPA Elite Custom Projector Mount builds on the foundation of the highly successful RPA mount, offering refinements in adjustments and a keyed locking system. 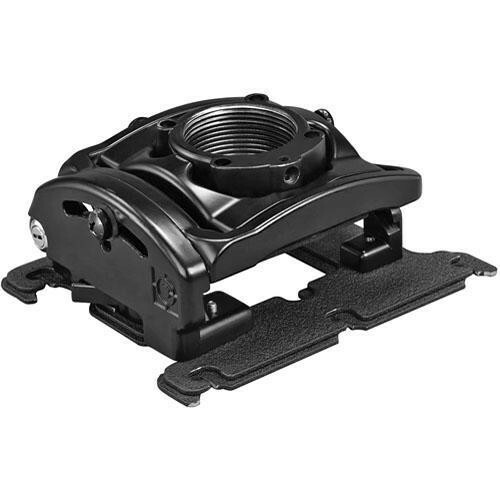 The 50 lb capacity mount features independent MicroZone adjustments as well as Centris Technology to provide fingertip positioning capability which automatically adjusts to accommodate specific projector weights. Shipped fully assembled, the RPMA245 is also quick to connect or disconnect for lamp or filter changes via the Q-Lock Release Lever. The lever integrates a key and lock security option besides maintaining precise remounting to ensure that registration and preset adjustments remain unaffected. The RPMA245 offers flexible installation options including ceiling flush mounting, 6.35 mm threaded rods or 1.5" NPT threaded extension columns. Microzone Adjustments make projector registration fast and precise (including flush mount installations). Centris Technology enables effortless fingertip positioning and self-adjusts to support different projector weights. Q-Lock Quick Release Lever provides quick connect/disconnect of the projector for convenient lamp and filter access on most projectors. Disconnecting maintains registration and doesn't affect pre-set adjustments. Cable management without additional accessories is provided. Integrated key and lock system. Mounting options include: flush mount to ceiling, use 0.25" (6.35 mm) threaded rods or use a 1-1/2" NPT threaded extension column. Universal interface with faster installation and lamp and filter access. Speed-Connect line of accessories further reduces installation time. Box Dimensions (LxWxH) 13.03 x 13.0 x 4.0"